Copenhagen calls itself “City of Cyclists” and some even consider it the cycling city of the world. I went to Copenhagen to further form my opinion. I used to know Copenhagen well. I visited the city often when I was much younger. Nine times I had been there, from 1973 to 1999, but I must admit I had never cycled in Copenhagen. It was high time for a tenth visit and for some serious cycling. After looking around and cycling criss-cross through the city on a weekday and in the weekend I can now also speak from my own experience about what I think about Copenhagen as a cycling city. People cycling on the busy H.C. Andersens Boulevard, next to 6 lanes of motor traffic. This is the future Cycle Superhighway Københavnerruten C98. “Will the world survive this event?” asked Erik Griswold on Twitter after I had tweeted I was riding a bicycle with the Danes. It is no secret that what I had said about Copenhagen before was not always positive. But I love the city. I have many fond childhood memories and to my own surprise I found my way instantly again, now that I returned after almost 20 years since my last visit. But I did come to check whether my feelings about Copenhagen’s cycling reputation were correct. The local consultancy company Copenhagenize Design has put out a list of best cycling cities in the world four times since 2011 and in the last two issues Copenhagen came first. This list has contributed much to the reputation, maybe even more than actual achievements. I have some experience judging best cycling cities. So I did some judging of my own this visit. 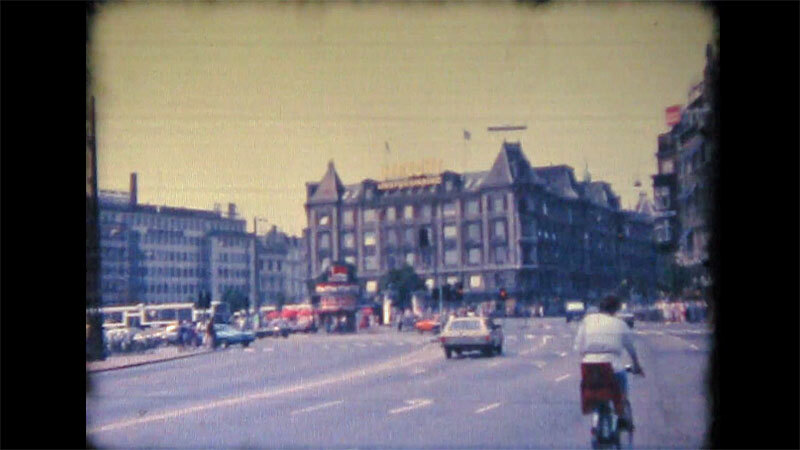 Still from a Super-8 film my father made in 1976 on one of our summer holiday visits to Copenhagen. 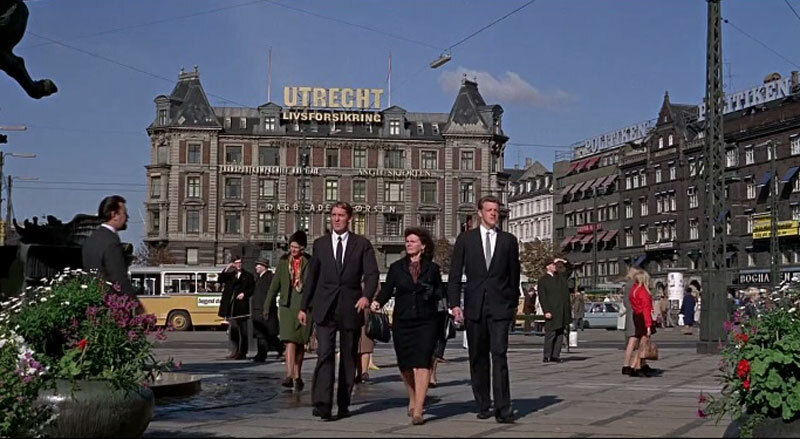 It wasn’t the wide street on Rådhuspladsen (City Hall Square) that he wanted to film. It was because of the text on the building, but unfortunately that is too hard to see. This is what my father wanted to film. The huge sign with “UTRECHT” that used to be on the roof of the Helmerhus aka the Utrecht building until 1995. It refers to an insurance company (originally from Utrecht) that held its office in this building from the 1890s to 1995. Picture: still from the 1969 Hitchcock movie Topaz. Without a doubt there is a lot of cycling in Copenhagen. Denmark as a country is always second-best when it comes to figures about cycling. It is hard to find reliable comparable figures for cities, but I managed to find some by the city of Copenhagen from 2017 and from Amsterdam and Utrecht by the Dutch Knowledge Institute for Mobility, also from 2017, about cycling to work. The Copenhagen figures include cycling to a place of education, while the Dutch figures do not, and I had to combine some of the other categories to make them comparable, but this is the closest comparison I could make. It does give you a good idea of the differences. There is relatively more cycling in Utrecht and Amsterdam than there is in Copenhagen, for going to work at least. In all international comparisons Denmark comes out as second-best for cycling. Graph from the KIM brochure “Cycle Facts 2018“. Comparing the modal share for cycling to work in Copenhagen, Amsterdam and Utrecht, in 2017, as best as possible. Recreated charts from information by the City of Copenhagen and KIM, the knowledge institute for mobility in the Netherlands. Stills from the film Cykelmagt 1+2 by Leif Larsen. Left a Copenhagen street in 1978 where cyclists had to ride with traffic. Right a reconstructed street in 1989 to give cycling its own place. Cycling straight-on through the top of a T-junction requires waiting for the light to change in Copenhagen. In the Netherlands you would almost always be able to bypass the red light. More recently the city has also built a lot of new infrastructure and not only cycleways. Between 2006 and 2016 I counted five new important bridges and viaducts. This includes the well-known Cykelslangen from 2014. That name means both cycle tube and cycle snake in Danish but in English publications the city refers to it as Cycle Serpent. Touted as something special, Dutch observers saw flaws too. The Inner Harbour Bridge from 2016 is the least attractive of the new bridges, from a cycling perspective that is. This bridge was designed and approved by people who apparently have no clue about cycling. The right-angled zig-zag movement you have to make on this bridge is an insult to anyone on a bicycle. 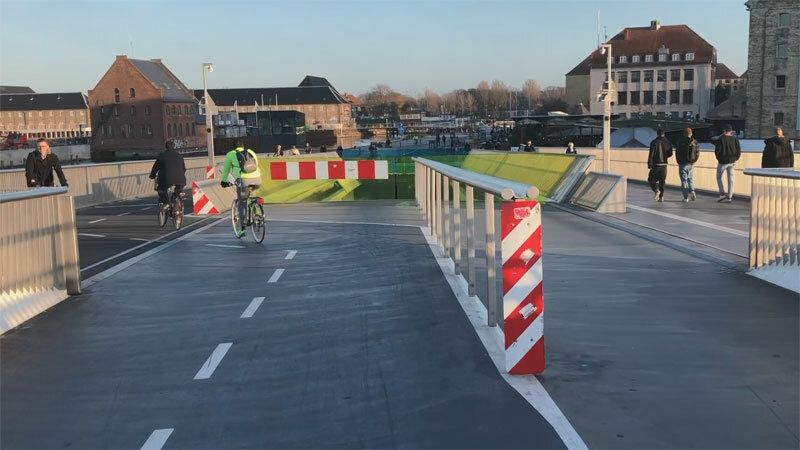 Researching for this post – after I had returned home again – I found that on this topic I wholeheartedly agree with Mikael Colville-Andersen from Copenhagenize, who has called it “a stupid, stupid bridge”. The Inner Harbour Bridge (Inderhavnsbroen) completed in 2016 is a design disaster. This becomes apparent from all the red and white warning signs brought in to make sure people on a bike don’t have an accident. But this bridge does not stand on its own. I found many details that are – in my opinion – not well done, crude, not given enough thought, or not executed in the best way possible. I was not the only one to notice this. For example, Copenhagen does not have many dropped kerbs. Instead you find asphalt ‘blobs’ to make it possible to mount or descend a kerb when you have wheels. It works – not very convenient on a bicycle and I hate to think how it must be in a wheelchair or with a stroller – but it is a clumsy solution and the blobs are downright dangerous to pass when they are in your path. Apparently they are described as a ‘Copenhagen Bodge’ by people from the UK. I find that a fitting description. At some locations the city put up a footrest (and an armrest) so you can start riding again when the light turns green in a more convenient way. The notorious bicycle counters in the streets (notorious, because they show figures that are totally different from the figures the city claims for the streets they’re in) do not work very well. Just standing next to them shows you that sometimes all cyclists are counted and sometimes not even 10 percent of the people passing them is noted. Which makes these counters a useless gimmick. These counters do not count very accurately. This entire group of people was counted as just one person. This renders the counters useless. Copenhagen has many one-way cycle tracks directly next to the travel lanes for motor traffic. There is often no other protection than the kerb height; a level difference. The Danes generally do not like buffers or traffic islands. They feel that those areas take up valuable space that you could better use for cycling. This leads to cycle tracks directly next to fast-moving vehicles. And also to the fact that there are no protected intersections. The Copenhagen design recommendations for intersections are very different from the Dutch. Often you see a stop line for motor traffic that is set back, giving cyclists a place to wait and then to start first when the lights change. Another option is to have a 4 second head start for cycling. If that can be given the need for the set back stop line is no longer there, according to the manual. Most traffic light installations work static. They are not fully actuated systems like we have in the Netherlands. Giving this a very “crude” feeling from a Dutch perspective. On most intersections the two directions (north-south and east-west) get an alternating green light, and that is it. Dutch traffic light installations are far more sophisticated and complicated than that. Which gives Dutch engineers a lot of advantages to organise and guide the separate traffic flows. It will not be soon that the Danish cyclist can influence the traffic lights with an App like we can in some cities in the Netherlands. At intersections there often is a right turning lane for motor traffic that also needs to be used by people cycling to go straight on. This feels unpleasant and counter-intuitive. Just like going to the right first in order to make a left turn. You wait in the corner of the intersections – unprotected – for the lights to change and then you can finish your left turn. On a protected intersection you wait at a location where people going straight-on pass behind you. On a Copenhagen intersection they pass in front of you because you have moved to the right first. Again, very counter-intuitive. The blue painted strip tells people where to expect cycling. Note the dashed line at the end on the right hand side. That is the place to wait for the light to change if you want to make a left turn. The manuals advise only two blue strips per intersection. They would otherwise confuse people more than protect them. The girl in the pink coat was one of the few children I saw cycling in the city. I was in the city on a Thursday until late afternoon, a Saturday and a Sunday, days you would expect to see children cycling, but I didn’t. I saw more children in a cargo bike than there were on their own bicycle. Some of the larger intersections have become extremely complicated because they have more than four arms for instance. It could help to change such an intersection into a roundabout, but Copenhagen has virtually no experience with roundabouts. There are only a few mini-roundabouts. There seems to be no desire to change that. This is different for cycle streets. There is one real cycle street in Copenhagen so far, Vestergade, but that is not much more than a sign that was put up in a further ordinary street. The Draft Cycle Statement 2018 designates eight streets that should become genuine cycle streets. Streets with a sufficient number of cyclists but that are too narrow to create separated cycling infrastructure. The city intends to use experiences with cycle streets from Århus (Denmark) and German and Dutch cities to improve the design. They also plan to use Dutch experience for that other topic: bicycle parking. In its Bicycle Account of 2016 the city noted that Utrecht, the busiest train station in the Netherlands (176,000 travellers per day in 2014), has almost 20,000 indoor bicycle parking places, while Nørreport Station, the busiest station in Copenhagen and Denmark (147,000 travellers per day in 2014) has 2,400, all of which outdoor. 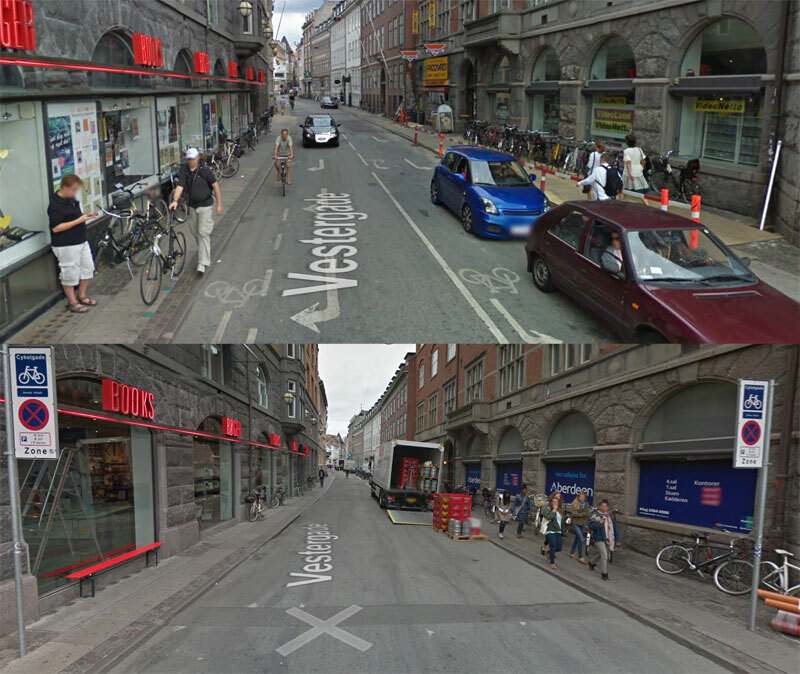 The only real Cycle Street in Copenhagen is Vestergade. It was changed from a one way street with painted on-street cycle lanes into a two-way cyclestreet. But apart from taking away the lines not much more was done than putting up two signs. The conversion took place between 2012 and 2014 judging from Google StreetView. The outdoor bicycle parking racks at Nørreport Station. The square was reconstructed after the metro line was finished (2015). It got 2,400 bicycle racks. The single-tier racks take a lot of space and the bicycles are not shielded from the elements. 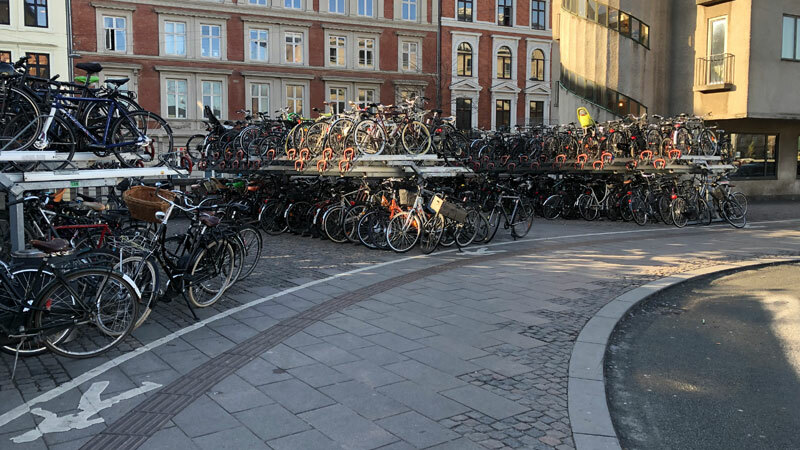 It would indeed be a good idea to improve the bicycle parking opportunities for the 27% of train travellers who arrive to Danish stations by bicycle (compared to almost 50% in the Netherlands). You can take the bicycle into many trains in Denmark, but you have to carry it on the station stairs. Those stairs do not generally have grooves for the bicycle which are so common in the Netherlands. In other words: you may take the bike in the train because then not much needs to be done for cycling at the stations. 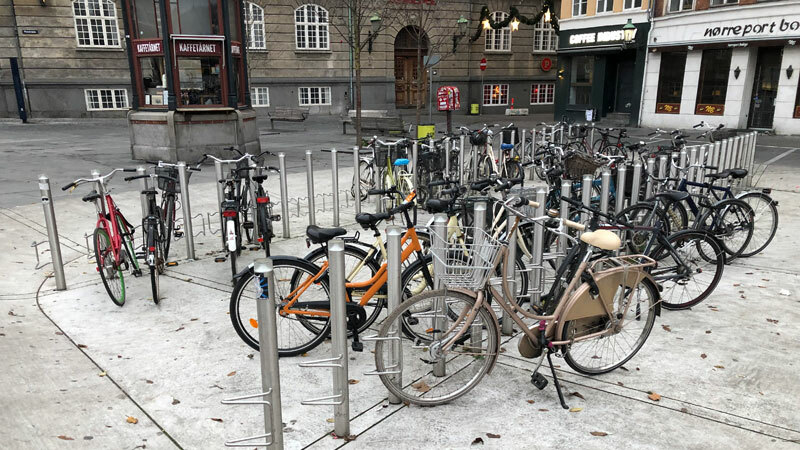 I was very surprised to see so many free racks on a Sunday near Nørreport Station. There seems to be truth in the saying that Copenhageners mostly ride to work and not for recreation. Hence less cycling on a Sunday. In front of Copenhagen’s Central Station I finally found some double stacked racks. Here too there were free racks available even on a Thursday. A luxury you are not very used to as a Dutchman. It really makes a difference when 27% of the train travellers arrive by bicycle or almost 50% like in the Netherlands. 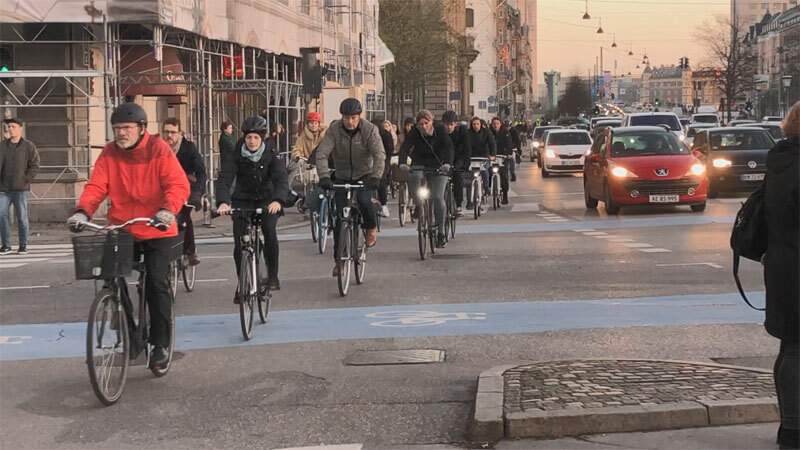 The Danes sometimes boast about things that are very common in the Netherlands and overall Copenhagen lacks many things to make life better for cycling compared to many cities in The Netherlands, as I described in this post. In his excellent three-part comparison series between the UK, the Netherlands and Denmark Robert Weetman concluded: “It’s no secret that overall I’m more inspired by the Dutch approach.” It’s no secret that I am too. I was under the impression that cycling in the Danish capital is quite good for many, especially when you come from a country with little to no cycling infrastructure Copenhagen will be impressive. But it is not as convenient and as good as the cycling climate that I am used to in for instance my hometown ʼs-Hertogenbosch or my city of birth Utrecht. My trip to Copenhagen and experiencing what it feels like to cycle there has not changed my opinion. 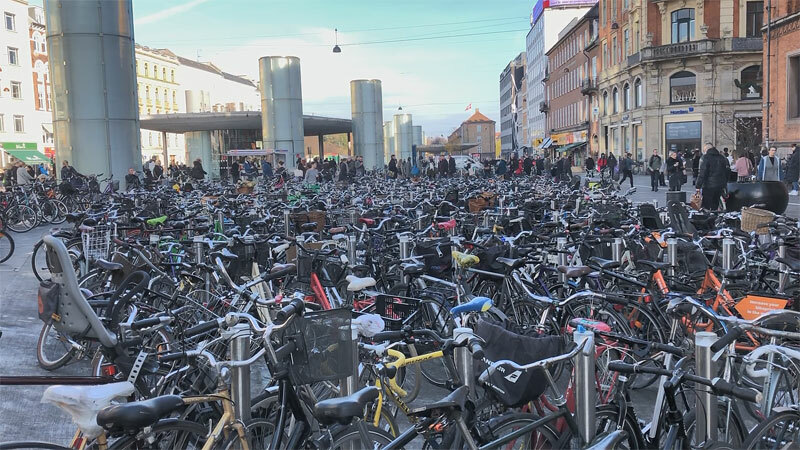 Yes, Copenhagen is a City of Cyclists, but Copenhagen is certainly not the Cycling City of the world. My video portrait of Copenhagen. As a danish bicycle planner, who has lived in Amsterdam, I can definitely agree that Copenhagen is not all it is made up to be. Although that being said I must agree with first commenter, Mikkel – having grown up in Denmark I would prefer cycling in Copenhagen any day, over cycling in Amsterdam, Utrecht, etc. That’s just habit and personal preference, for separate asphalt lanes, rather than paved ones or shared (low volume) space. But when it comes to the point of taking off my habit-oriented glasses, my professional self sees all the points where the dutch approach to cycling works way better than what Copenhagen manages – creating less of a fuss about how ‘dangerous’ it is, getting more kids riding on their own, allowing for two adults on each bikes, etc – it is all things that creates a far broader culture around cycling. 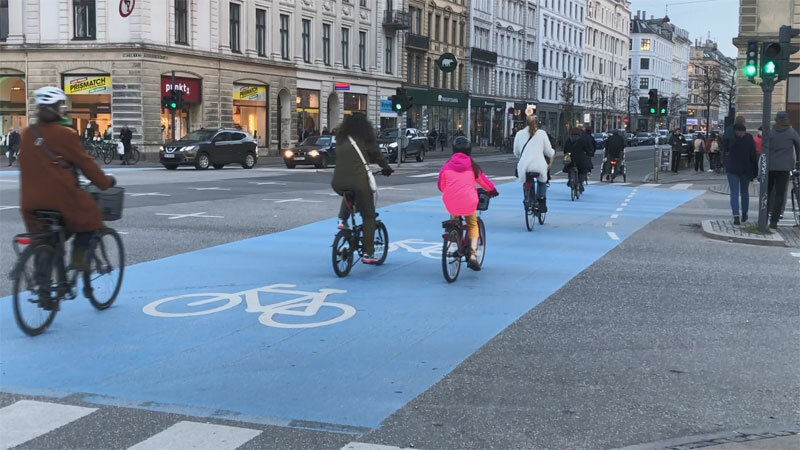 As an example the typical CPH intersections with the blue paint, are rubbish compared to the dutch version with separated waiting areas for turning left – no doubt about it. Roundabouts are not often seen in Copenhagen, but there are plenty of roundabouts out in suburbia, with separated bicycle priority all way round. Same style as in the Netherlands. Just a note: the dashed line at the intersection picture with the blue paint, is not a waiting area, but a connection from the intersection to Vendersgade, for those not wishing to continue straight ahead along Frederiksborggade. Although this shortcut to Vendersgade is extremely useful, finding the waiting areas for left turns are indeed counterintuitive when reaching this intersections – if one grows up in Denmark, the waiting area is intuitive, for most other intersections than this, but that does not mean that this should be considered best practice, but rather that it is consistent throughout the country. Furthermore: I can only support Jasons comment on how cycling in Copenhagen seems to be more familiar/transferable when arriving from abroad, rather than the cycling utopia of the Netherlands. “In short, the Dutch are clearly better just about all things cycling, but I think as long as Copenhagen “feels familiar”, it’s always going to be the “role model” for people from car-centric places.” This is very much the response I get from non-dutch/danish professionals that I give bicycle infrastructure tours of Copenhagen to. 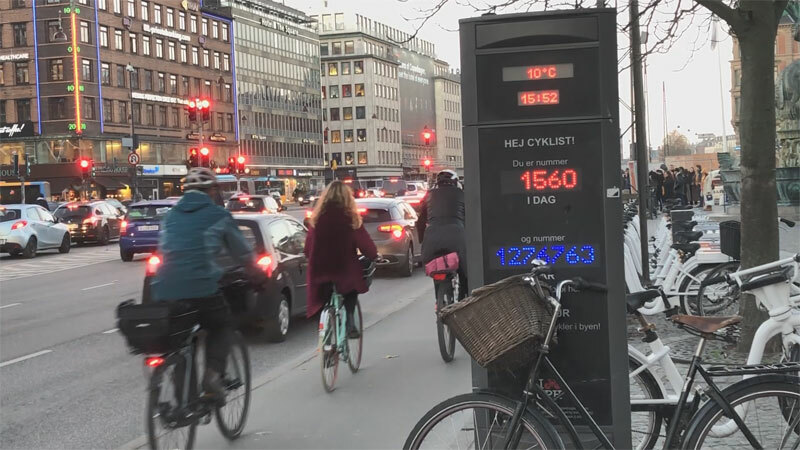 Pingback: How convenient is cycling in Malmö (Sweden)? Funny how you favour your own home country. As a Dane living in Amsterdam, I hate cycling around both here, in Utrecht and in Rotterdam. Narrow and very uneven bike lanes and pavement all around. Next time you go to the best cycling city, maybe take off the glasses and be honest. I don’t favour my own country. I favour good cycling infrastructure. See my post about Malmö. Copenhagen simply is not as good as it makes the world believe it is. That is a fact that needed to be said. I had exactly the same experience a few years ago, going to Copenhagen shortly after visiting the Netherlands. There were many times I was put in situations that felt very uncomfortable, due to a lack of cycling infrastructure. Especially concerning were the shared cycle path + right-turn lanes for cars. Also, the cycle paths are often just unmarked black asphalt, so it was sometimes unclear if I was in the “right place” after turning onto an unfamiliar street. In short, the Dutch are clearly better just about all things cycling, but I think as long as Copenhagen “feels familiar”, it’s always going to be the “role model” for people from car-centric places. I hope that people living anywhere like my home town look to both the Netherlands and Denmark for inspiration – perhaps starting with learning about Dutch infrastructure, but definitely also learning from Copenhagen’s very remarkable achievements. As part of the final ‘Planning the Cycling City’ session this year, one of the ideas which arose, from the international participants, was that the Netherlands needed to become more proud of it’s own position internationally (in terms of the issues you discuss). The way I think of this is that Copenhagen is rightly proud, and rightly positive about marketing its progress on supporting cycling. I’d like Copenhagen to continue to be proud – here we can even learn from the ‘Copenhagen Bodge’ (as a simple way to create something much better than we often have here). On the other hand the people-friendly urban infrastructure of the Netherlands has become so commonplace that many Dutch people don’t notice how remarkable it is… and then they forget to tell the rest of the world about it. The consequence of this – as USbike above says – is that even some Dutch people have begun to believe that Copenhagen is the best place in the world for cycling (and walking, living, etc). In these few seconds that we have your full attention, from everything we would say to you, THIS is what we want you to know; at home we often hear that *Copenhagen* is amazing because of how good it is at supporting people to cycle. We would like the *Netherlands* to be much better at telling the world about how proud *it* is about how good *it* is at supporting people to cycle. Of course *we* can learn from both, but many of the cities here [in NL] offer a vision of how it is possible for bicycle use to play a key part in creating *places*, not just efficient transport, which are focused on human beings, not just getting around. *We* would benefit from you getting better at this because there is so much you can teach us. *You* would benefit from this because your pride about what you’re getting right would lead to more awareness about what you’re getting right, and this would safeguard and protect what you’re getting right against what *will* be ongoing threats and the risk that this is eroded. “75% of Copenhageners cycle all winter” says “Viking Biking” blog. It would be interesting to know how much people cycle all winter in the Netherlands. 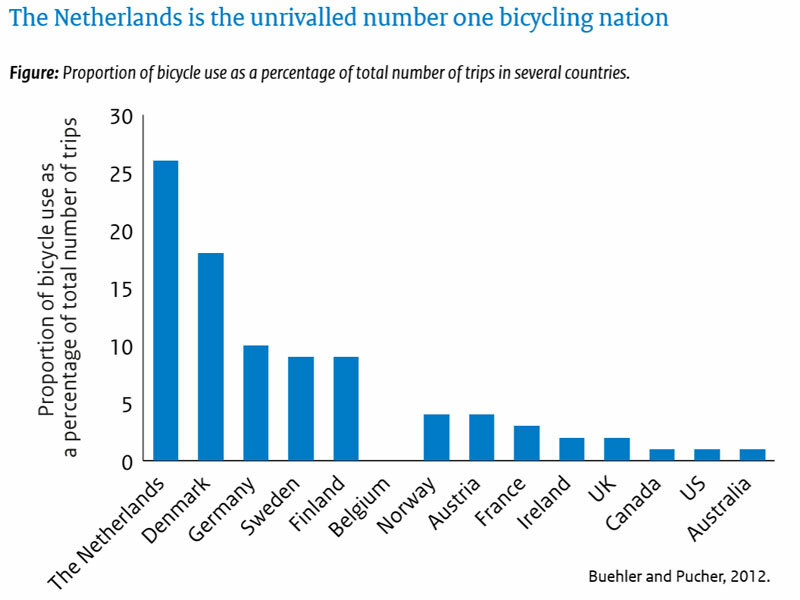 For the Netherlands there is data, see “Tabel 2” of http://www.vervoerswetenschap.nl/attachments/article/278/TVW_2012_12_Rietveld%20et%20al_Fietsen%20door%20weer%20en%20wind_48_4.pdf, and see the “Fiets” row and the last column where Zomer=Summer, Herfst=Autum, Winter=…Winter. So the short (not very precise) answer is 85% of all Dutch cycle all winter. Personally I like it when the temperature is lower, you can reach a higher speed without overheating. Not sure how much impact there is on recreational cycling summer versus winter. I think that people that do regular recreational cycling base their decision more on rain and (more pronounced) cold but apart from that I do not expect a too big effect, at least if you leave out holidays. I don’t know about touring-type recreational rides with the hybrid/tour bicycles, but the recreational cycling with racing bikes drops precipitously in the winter (I do it myself as well in late spring, summer and early autumn). Not only does the cold make it more of a pain to dress sufficiently with lycra clothing, but especially when the roads get a bit yucky then you really don’t want to ride in those conditions. Both you and your clothing will get quite dirty and the salt is also not good for these bikes, as they are completely not protected against the elements. In the Netherlands the majority of the recreational rides with the hybrid/tour/electric bicycles I think, racing bikes are a larger minority. Apart from that, the Netherlands is located to the sea and has a moderate climate, the winter is not too cold and the summer not too hot. Racing bikes indeed typically stop somewhere end of the autumn but with a “normal bike” there is less reason to do so. I think the road quality does not really deteriorate in winter except when there is snow but that is typically less than 10 days a year. Thanks for the English version, but how do you conclude that these figures are for non-recreational cycling? On p. 40 (or 54 in PDF) there is an English version of the table and I don’t see it explained. I think you are right, the table Bicycle row seems to be for all cycling. Pretty good summary. There are some more bidirectional off-road cycle routes through parks and along quiet residential areas forming rings around the city as you move outward, however not all the road crossings are so wonderful (though there were a few impressive bridges too). I found some real roundabouts as well, in the southern neighbourhoods, but they had the dangerous design of cycle lanes painted on edge of the roundabout. The asphalt blobs and the lack of protection are connected. Without a buffer there is no place to lay out the dropped kerb. In the UK there are many of these ‘cycle tracks’ with no protection from motor traffic except for a level difference (and usually quite narrow in width too). Except that wherever a dropped kerb is needed, it is just inserted into the cycle track, causing it to dip up and down and create a hazard to anyone cycling there after dark. Without a buffer from traffic, other street furniture gets planted in the cycle track as well, such as signposts and light poles, occasionally parked cars, etc. Sigh. One fun thing I did over in Denmark was take a bike on the train over the Øresund bridge to Malmö. I highly recommend it, it’s a nice city. Malmö is 45 minutes away from Copenhagen and they have quietly built their cycling levels up but their infrastructure looks nothing like Copenhagen. If anything, it looks like they received more Dutch influence, with protected junctions even, though not as well developed. I took the same train to Malmö and spent two days there riding.The next international city portrait will indeed be about this Swedish city! You are right about the connnection between the blobs and the lack of protection, but even without the space better solutions are available than just the asphalt bodge. Good. That lays to rest the debate over which country is more advanced in cycling. It’s going to be a long time, if at all, before anyone catch up to The Netherlands. Belgium is doing extraordinary well. Some of it bests The Netherlands but overall it’s got a ways to go. I’m calling on all citizens to demand dedicated bicycle paths that connect the entire world! The savings in healthcare alone would pay for it many times over! Like Mark, I’ve been to Copenhagen many times over the years and it is probably my most favorite city in the world for just about everything except the cycling. It is undoubtedly among the best cycling cities in the world if Dutch cities were excluded. But having lived in the Netherlands for 2 years now, I simply cannot agree with the #1 ranking that the overblown self-marketing analysis always seems to erroneously conclude. Yet it is so effective that I’ve had Dutch colleagues who thought that Copenhagen was even better for cycling than Dutch cities! I have experienced first hand all the deficiencies Mark pointed out, and fully agree that all of them are not ideal. 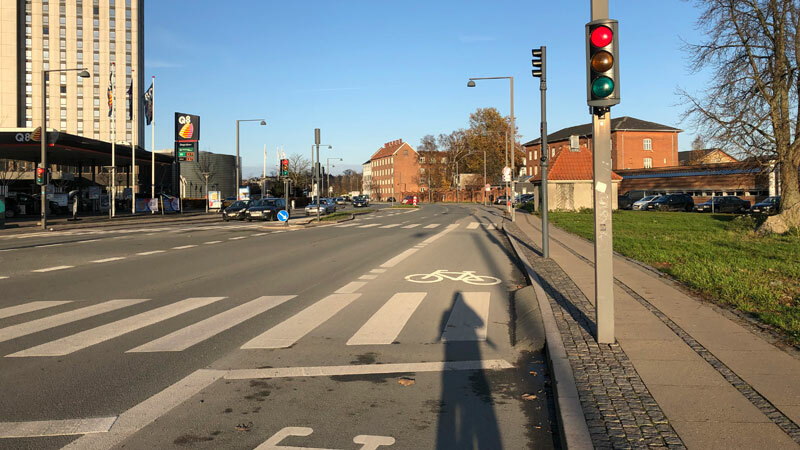 Now in practice, even things like the combined right-turn car and cycling lane at junctions aren’t so bad because there are so many cyclists in Copenhagen and most motorists are used to them. But in a 1:1 comparison, Danish infrastructure is inferior in almost every aspect. One of my biggest complaints of Copenhagen is that its double parking bike racks are usually not the extendable kind. Thankfully this is standard in the Netherlands because I cannot imagine having to lift my 20+ kilo omafiets to the top rack all the time. The one thing I do prefer about the Danish system is taking bikes on trains, especially the S-trains in Copenhagen. Aside from the stair issue at some stations it’s much easier (also free and with no rush-hour restrictions) to take your bike onto these trains. There’s much more space on the train compartments and you can wheel it right off. I understand the difficulties facing Dutch trains given the high number of cyclists. As result, many people have a bike at each end of the train ride, use a folding bike or options like the OV fiets. But sometimes I do need to bring my regular bike on the train, and it’s quite annoying to say the least. There’s very little space (3 or 4 bikes at best in older intercity trains), is often crowded as a result, is quite pricey at 6.2 Euros for the day ticket and is forbidden during rush hour which makes it a huge hassle for meetings in smaller towns that lack the OV fiets. But other than that, everything else is great for cycling in the Netherlands. 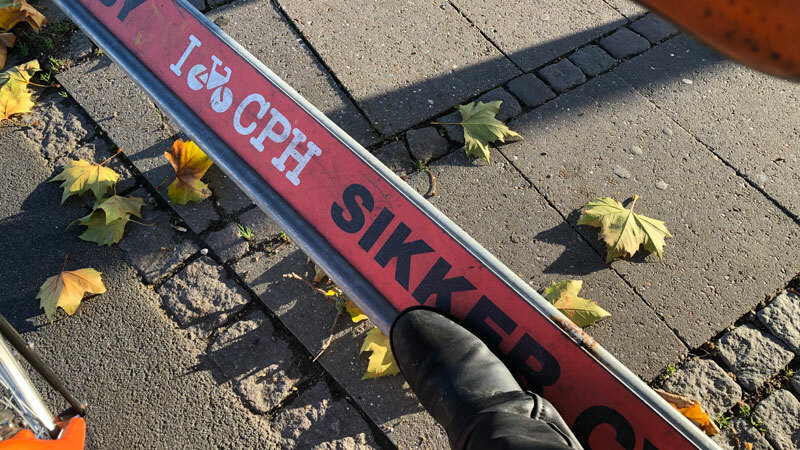 This entry was posted on 27 November 2018 by Bicycle Dutch in Original posts and tagged bicycle culture, Copenhagen, cycle paths, denmark, urban design, urban planning, watching people cycling.